Tara Lee is a London-based yoga instructor well-known for her "Pregnancy Health Yoga" DVD, a best-selling pregnancy video in the UK. In this new Elements of Yoga series, Lee has created three separate DVDs based on the elements, each with a different focus. As she explains in her short introduction to "Fire Dynamic" (or Fire Vinyasa, as it's titled on the Main Menu), the purpose here is create heat in the body and to release toxins by incorporating twisting postures. For all practices on this DVD, Lee teaches via voiceover. Fire is set outdoors at night, with several large flaming tubs placed around the set, casting smoke throughout the video. Lee's main prop is a mat (with the orientation frequently changing from parallel to the viewer to perpendicular due to shifting camera views), although occasionally an inset is shown with modification options, and she also uses a blanket for shoulderstand. Lee sometimes notes the names of the postures in English, sometimes in Sanskrit, sometimes not at all. The Main Menu of the DVD offers the following options: Introduction--Play Workout--Practice 1 (20 mins)--Practice 2 (20 mins)--Practice 3 (35 mins)--Shavasana (5 mins)--Bonus Features--Music Options. Music Options includes choices for "Music & Instruction" and "Music Only," but no option for "Instruction Only" (a.k.a. a "Music Off" option). The individual practices work as stand-alone sequences, but they can also be combined together for a full routine. I have provided detailed information on each practice below. This practice focus on breath and core work. Lee starts seated for about seven minutes of breathwork, including ujjayi breathing, Kapalabhati (skull shining breath), and breath retention with bandhas. Core work begins with boat pose variations, including moving one arm and one leg. Coming to all fours, Lee performs cat/cow with lion's breath and then bird-dog, adding an elbow-to-knee touch; she finishes this sequence with kneeling dancer's pose and hip circles. Lee then moves between forearm plank and forearm down dog. She does a twist in an all fours position and then plank with fast knee-ins. After resting in child's pose, she performs several vinyasas: down dog to plank, down dog to knees hovering above the floor, down dog to toe lifts, and then down dog to bent knees. Lee comes to standing and concludes with a twisting standing forward bend and chair pose. Lee suggests setting an intention (sankalpa) at the start of this practice. She moves through a forward bending sequence with breath retention, then comes through a vinyasa back into down dog and side plank. After a single sun salutation, she moves through another vinyasa to 3-legged dog. She brings in the knee to chest three times and then ends in pigeon pose, adding a twist to either side. Returning to 3-legged down dog, she brings the knee in to the opposite side three times before coming into a straight leg stretch and then repeating the entire series on the other side. Returning to standing, Lee concludes this routine with big toe and gorilla forward bends. This was the only practice that truly centered around twists as Lee mentioned in her introduction, but the fact that it was so much longer than the other two routines on the DVD felt unbalanced to me. The initial focus is on standing postures, and Lee moves right from a vinyasa into a standing pose flow including warrior 1, warrior 3, half moon, and triangle (repeated on other side). The second series starts with revolved low lunge (optional bind) and continues with pyramid pose, revolved triangle, revolved half moon, and 3-legged plank pose; after repeating on the other side, the sequence concludes with wide-legged standing forward bend. Next, Lee moves into tree pose, adding in a side stretch. This is followed by toe balance and an arm balance, flying crow pose. Moving through a vinyasa to squatting, Lee performs another arm balance, crow, and then several seated postures, including cobbler's pose, wide-legged seated forward bend, half Lord of the fishes pose with a twist to the opposite side, and double pigeon. She then transitions to her stomach for several backbends, including locust, bow, and camel, then (returning to her back) bridge and wheel pose. She windshield wipers the knees and then performs a twist with the foot resting on the knee. Lee cues shoulderstand (she uses a blanket here) for about 1 minute, coming out of this posture into plow, deaf-man's pose, and fish. A short (1.5 minutes) savasana concludes this routine. For this balanced-focused sequence, Lee starts by moving between her toes and a squat several times. She then performs tree and eagle on both sides. This is followed by a flow between knee-to-chest and warrior 1, then holding and moving the knee out to the side. The final balance posture is dancer's pose. For this seated routine, Lee starts by lengthening the length of the exhalation so that it is twice the inhalation. She continues with basic breathing, meditating on inhaling a golden light. She performs two rounds of Kapalabhati and finishes the practice with three OMs. In-this core-centered sequence, Lee starts by moving in and out of boat pose. She then comes fully to a reclined position for leg lowers. Other moves include leg extensions, knee drops, and more traditional crunch-type exercises. 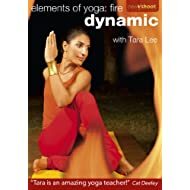 Unlike the other DVDs in her Elements of Yoga series, "Fire Dynamic" is clearly intended for experienced yoga practitioners only. Although Lee provides decent instruction overall (but not mirrored cuing), she does not offer enough information for those newer to yoga. This DVD would be best suited to those looking for a more intense yoga experience while still incorporating breath and stress relief.